Rogue waste crime operators could be slapped with new fines if they mislabel their waste to dodge tax rules, an independent review ordered by Environment Secretary Michael Gove has recommended. The review also concluded that compulsory electronic tracking of waste could help clamp-down on illegal movements of waste at home and abroad, and that there should be financial penalties for producers if their waste is found to be deposited illegally. The recommendations come from a major independent review ordered in June. It looked at the government’s approach to tackling waste crime, which cost the English economy more than £600 million in 2015. The recommendations of the review will now be considered and responded to in Defra’s forthcoming Resources and Waste Strategy. "The threat to society from waste crime is real. Criminals are running illegal waste sites as a cover for theft, human trafficking, drug running and money laundering. "It is costing our economy millions of pounds each year, and blighting our communities. "I welcome today’s review. We are committed to clamping down on these unscrupulous groups and we will set out our next steps in our forthcoming Resources and Waste Strategy." • a national database of registered waste brokers to make it harder for unscrupulous operators to do businesses. "In this report, we set out how we can modernise the structures, capabilities and powers to manage and reduce the problem of organised waste crime now and in the future. "Our intention must be to give the criminals responsible real cause to fear the consequences of their actions. Today that is not the case. "I would like to record my thanks to my review team, my advisory board, colleagues at Defra and the Environment Agency." 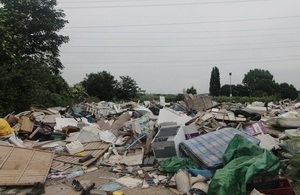 Between 2011 and 2017, the Environment Agency stopped the operation of 5411 illegal waste sites. "I welcome this review. Serious waste crime is the new narcotics – it damages the environment and harms local communities. "The review rightly recognises the dedication of Environment Agency officers who work tirelessly to bring the criminals to justice. In the last year, the Environment Agency has closed down over 800 illegal waste sites and brought almost 100 successful waste crime prosecutions. "But there is still more to be done. This report represents an opportunity to ensure we have the right powers, resources and coordination to win this fight." The recommendations of the review will now inform a strategic approach to waste crime, which will be published in the government’s forthcoming Resources and Waste Strategy later this year.